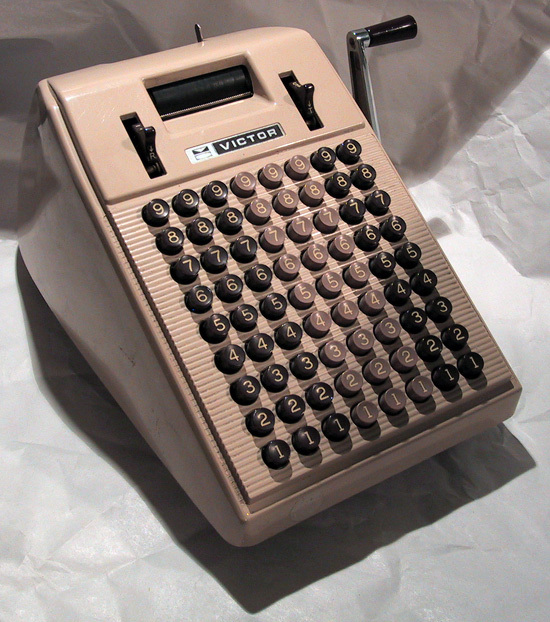 The Victor 6834 uses a comptometer-style input system, with a row of sequential input keys for each digit. 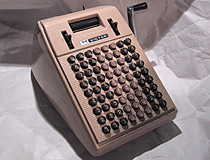 Although this machine is capable of displaying up to nine digits, only eight of then have input keys, as is normal for comptometers. The unit has no display; each number entered into the machine is printed on a standard roll of adding machine paper that is loaded into the back of the device. There is a mechanical accumulator suspended from the underside of the machine, and the lever to the right of the display is used to print and erase the contents of the accumulator. Subtraction is also possible by using the lever on the left side. Unlike many other comptometers from this era, the device has no motor. All mechanical power comes from pulling the lever on the side of the machine. Victor 6834 adding machine, at rest.